60W AC-DC adapter, synchronous rectification, fixed frequency current mode PWM controller. Very Low Quiescent Burden, Efficiency above 85%. That's Green. 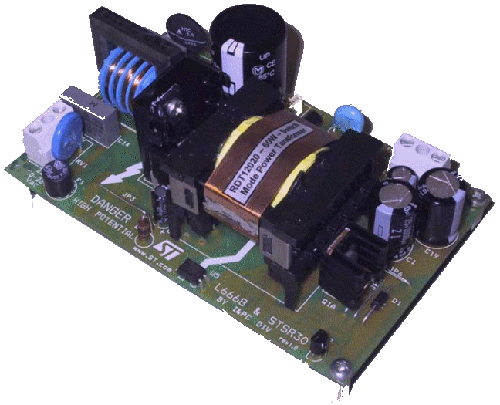 STMicroelectronics - EVALSTSR30-60W. Synchronous rectification using L6668 and STSR30. The converter works in both Continuous and Discontinuous conduction mode depending on the input voltage (the circuit has a wide input voltage range) and the output load. The 68-kHz switching frequency provides a good compromise between the transformer size and the harmonics of the switching frequency, optimizing input filter. The input section includes protection elements (varistor, fuse and NTC for inrush current limiting), a standard Pi-filter for EMC suppression, a bridge and an electrolytic bulk capacitor as the front-end AC-DC converter. The transformer is a layer type, uses a standard ETD34 ferrite core and is designed to have a reflected voltage of 95V. The power MOS is a 700V - 1Ω and a transil clamp network is used for leakage inductance demagnetization.